One thing that I share in common with many readers of my blog is the love of books. Many of you know that I worked for B. Dalton Bookseller from 1975 to 1982. I opened the store in Laredo, TX and managed two different stores in Oklahoma City. I made a brief return in 1986-1987 at a Silicon Valley location. I have been an active reader of books both before and since. One of the things that was great about the publishing industry in the United States in the first three-quarters of the twentieth century of the twentieth century was the diversity of publishing houses. Economic reality has changed all that, and consolidation in the industry has greatly reduced the number of separate houses. I did an informal survey, and the results are sobering and rather sad. Random house had always been the 800 pound gorilla in the industry, and that is still pretty much the case. It is now owned by the German conglomerate Bertelsmann, and includes once-time rival Doubleday, as well as Dial/Dell/Delacorte (which I believe Doubleday had previously acquired), Crown Books and its imprints (Clarkson Potter, Harmony, Broadway Books), the Jewish-focused house Schocken Books, and the once-independent Ten Speed Press. I remember in the 1970’s when Penguin Books bought Viking Press. Penguin Group USA now includes Putnam, Dutton, Prentice Hall, New American Library, and the science fiction house Ace Books. No doubt you saw that the Random House owner Bertelsmann and Pearson, owner of Penguin, agreed to a merger of the two houses in 2012. That transaction closed on 1 July 2013. Lots of other consolidation as well. Esteemed Simon and Schuster now includes Free Press and Scribner. Houghton-Mifflin and Harcourt are now one house. Little, Brown is owned by the conglomerate Hachette. HarperCollins now owns the religious publishers Zondervan and Thomas Nelson. Macmillan, part of Holtzbrinck Publishing Group, owns Farrar, Straus and Giroux and Henry Holt. I noticed an interesting combination among the smaller houses. Atlantic Monthly Press, respected for quality mainstream work, and Grove Press, well-known for its countercultural work in publishing the beat authors William S. Burroughs, Jack Kerouac, and Allen Ginsberg are now combined as Grove Atlantic. Some of these consolidations have been in place for a decade or more, but it’s only recently that I have taken the time to pause and survey the landscape. Publishers are changing with the times in order to survive. Today I read my books almost exclusively on my iPad Kindle app. But as publishers adapt to electronic delivery, and we readers continue to support them, even if we are buying eBooks rather than paper books, I am confident that the industry will survive. This was the year for doing things differently during the holidays for Terry and me. After Thanksgiving I wrote about how a comment on NPR to the effect of “cranberry sauce is easy” motivated me to make my own after many decades of Ocean Spray, going back to my youngest childhood days. The recipe from Giada was superb. I did the same recipe for Christmas with full confidence. Speaking of confidence, I wrote last week that Terry and I decided to change our Christmas tradition this year by cooking prime rib. 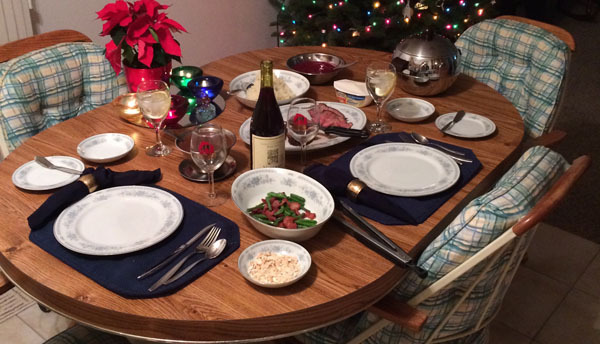 We were both a bit nervous as we hade never made prime rib before, and it’s not something that you want to mess up. I printed out three somewhat variant procedures I found online. I had advice based on years of experience from my friend the Boston Pobble. And we had the flyer printed by our local Rocca’s Market. When I ordered the prime rib, Mike, our seafood guy at Rocca’s, took my order. For two people he suggested a single rib, so I followed that advice and that’s what I ordered. When I picked up our single rib I was helped by Tom, co-owner of Rocca’s and the guy who runs the meat department. He was a bit concerned because out cut was so small, but gave me some suggestions. In the end, we let our oven’s probe make the final call, and left it in until it reached the desired temperature. We pulled our prime rib out of the oven, put in a standard meat thermometer, and let it rest for twenty minutes. We had rubbed the meat with a locally made spice rub from Rocca’s. The result, in a word, was spectacular. Add rolls made from scratch, home cooked mashed potatoes, and green beans with bacon (another innovation, this one on Terry’s part). It was a meal that made us stop and think about how much we have to be grateful for. It also reminded us of what the two of us can pull off when we each do our bit. And our endeavor showed us that change and updating traditions can be a Good Thing. I’ve loved this Neil Diamond rendition of the John Lennon classic since the first time his Christmas special was broadcast. I know that this song is about Hanukkah, and I know that Hanukkah was unusually early this year. But it seems appropriate on this day as we move from the Solstice, the shortest day of the year, to Christmas Day yesterday, as the days start getting longer and we celebrated (and continue to celebrate — Christmas is twelve days) the arrival of the Light. Besides, it’s simply one of my favorites, and that’s reason enough to share it. For the last I-don’t-know-how-many years, Terry and I have done turkey for both Thanksgiving and Christmas. For a few years we ordered a turkey breast from Whole Paycheck, but that was something of a pain because we had to head up into the Greater San Jose area, and any Whole Foods is by definition in a high-traffic congested area. Last year we discovered Rocca’s Market and ordered both our Thanksgiving and Christmas turkeys there. This year we got our Thanksgiving turkey at Rocca’s, but for Christmas we decided we were in a rut. 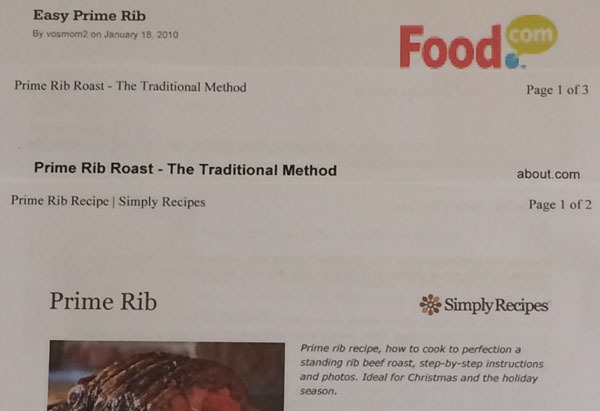 After discussing it, we decided to do prime rib for Christmas, and placed our Rocca’s order for that. Terry has been known to order prime rib when we dine out, but neither of us has ever fixed it before. I’ve been sorting through a variety of variant instructions for cooking it, trying to figure out which one will work the best. It will be an adventure. Suggestions welcome from those of you who have experience with this cut.